As promised, here is craft fair project # 3. It’s Foil Frenzy Specialty Designer Series Paper (DSP) meets Gift Bag Punch Board! 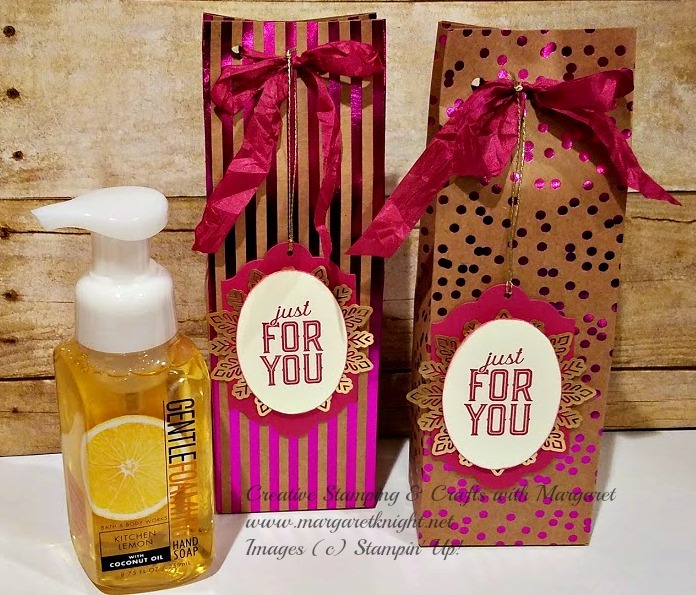 I decided to purchase some of the Bath and Body Kitchen Liquid Hand Soaps and make gift bags to package them as “Grab and Go” gifts. The packages are great for Hostess gifts to have available when needed. A tag was added with extra gold cord so that it could be removed, signed on the back and easily replaced on gift with shortened cord closer to the ribbon tie closure. A handheld punch was used to punch a small hole in the top of the tag but you could just use Stampin’ Dimensionals to attach the tag under the ribbon bow, if desired. With the Foil Frenzy DSP, the gifts are appropriate to use not just for the holidays but for any occasion. To make the bag, cut one inch from one side of the DSP so the piece will measure 11″ x 12″. Follow directions for using Gift Bag Punch Board to make a large bag. The 11″ side is the height of the finished bag. Note: it requires more force to punch the Foil Frenzy DSP and the dotted DSP pages seemed easier to punch than the striped DSP pages so don’t be alarmed that if it requires your brute force! It’s worth it as the bags are beautiful. Tags were cut using the Lots of Label Framelit Dies and the Layering Oval Framelits. The sentiment from Merry Little Labels was stamped in coordinating ink (in the samples shown, Berry Burst Classic Stampin’ Pad was used). The stamped oval was layered on a Foil Snowflake prior to attaching to the large label. Thanks for stopping by! Check back tomorrow for the next project.